At the beginning of a Forrester Wave™ or Forrester New Wave™, Forrester invites vendors that meet our inclusion criteria to participate in our research. When a vendor returns the questionnaire (for a Forrester Wave) or provides Forrester with a briefing/demo session (for a Forrester New Wave) according to our timelines, it confirms its participation in the research. Once a vendor completes these actions, we treat it as a participating vendor and score it according to our Forrester Wave and Forrester New Wave methodologies. We reserve the right to evaluate products and services, regardless of whether vendors participate. An evaluation that leaves out an important provider would be an incomplete portrayal of the market and therefore incomplete guidance to our clients. There is no vehicle for vendors to remove themselves from a Forrester Wave or Forrester New Wave evaluation. The inclusion or exclusion of a vendor in a Forrester Wave or Forrester New Wave report is exclusively Forrester’s editorial decision. The research will state if a vendor did not participate in the research. 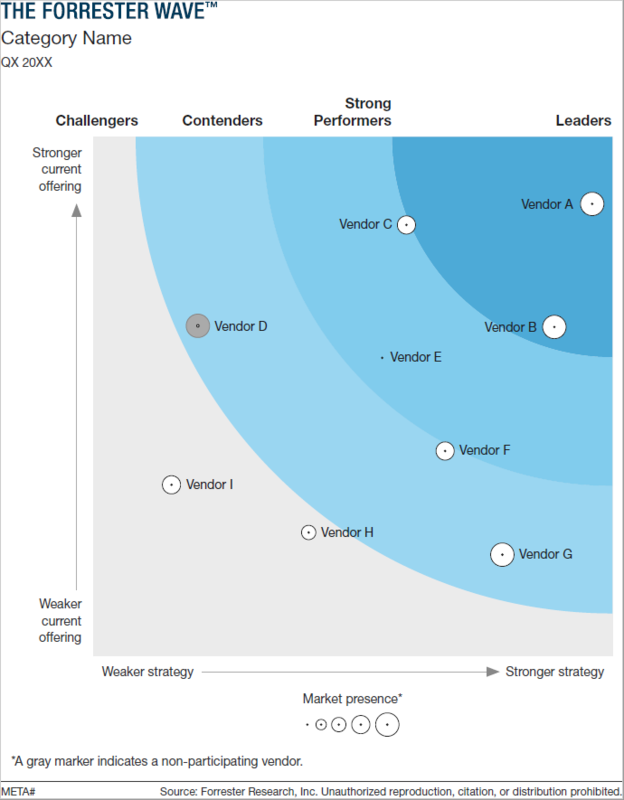 We’ll clearly identify nonparticipants on the Forrester Wave or Forrester New Wave graphic with a gray bubble instead of a white one (see figure below), and label them as nonparticipants with an asterisk/footnote. In addition, the vendor’s write-up and published scorecard or QuickCard will state that the vendor did not participate in our research. We will score nonparticipants using information available to us. Forrester will try to gain information about nonparticipants through primary and secondary research. For example, we might use public information, data gathered via briefings, and independently sourced client interviews to score the vendor. We may ask the vendor for a briefing. We may also rely on estimates to score vendors, which we will note in the vendor’s scorecard. Nonparticipants won’t be able to contest scores and won’t be covered by our Forrester Wave™ Vendor Review Policy. Once Forrester has scored a nonparticipant, we won’t review or adjust scores based on the vendor’s feedback, and the vendor won’t have the option to escalate to a Forrester manager. If a vendor participates in our research but does not submit specific information that we request, we treat the vendor as an incomplete participant. In areas where we are missing information, we will score vendors using information available to us. We may also rely on estimates to score incomplete participants, which we will mark in the vendor’s scorecard. Incomplete participants won’t be able to contest scores in areas where they didn’t submit complete information. If an incomplete participant fails to provide information in multiple areas, we reserve the right to mark that vendor as nonparticipating and treat the vendor according to the aforementioned policy. Attend the kickoff teleconference at the beginning of the research process. These hour-long presentations clearly illustrate the methodology from beginning to end and provide key dates and deadlines — including the deadline to confirm participation and dates when we will stop collecting information. Thoroughly review the policies listed on the Forrester Policies page. This includes The Forrester Wave™ Methodology Guide, The Forrester Wave™ Vendor Review Policy, The Forrester New Wave™ Vendor Review Policy, and this document.